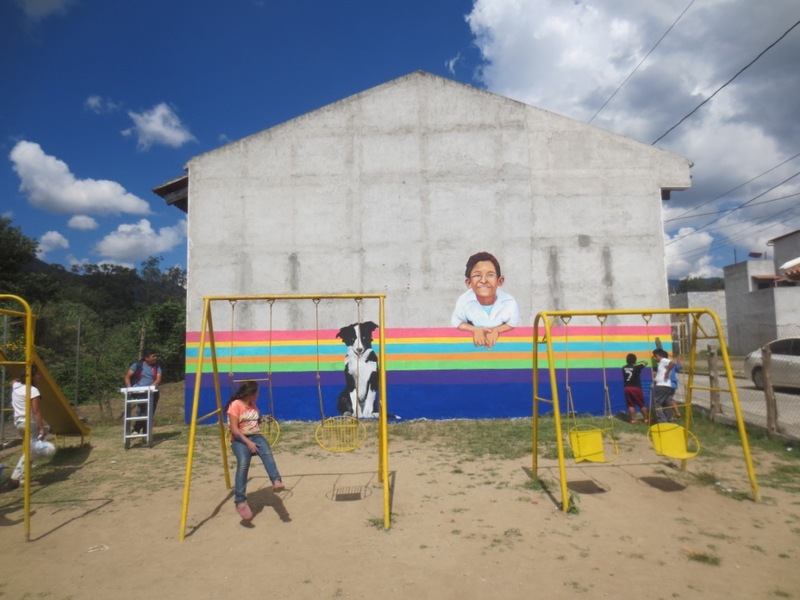 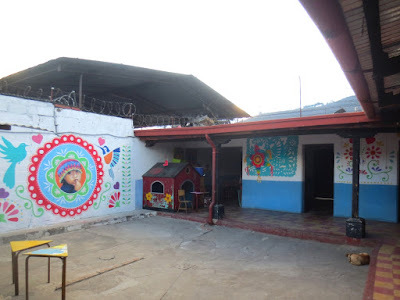 MuralArteGuate is an Antigua Guatemala based project that offers mural paintings to schools, clinics and community centres. I love to teach and I love painting on a large scale, so creating murals in collaboration with local communities is a great fit. Sometimes I paints my own designs, other times the theme of a mural is decided on by the target group and elaborated as teamwork. 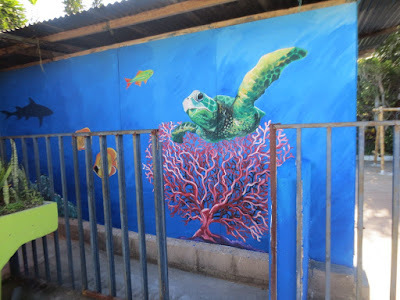 Since most schools, public clinics and community centres can’t afford to pay for a mural, I'm always looking for sponsors who are willing to help realize a permanent and socially engaged work of art in and for the community. 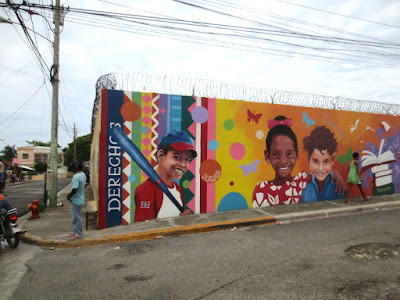 Besides beautifying the surroundings, murals are usually painted in public spaces and thus make art free and available to the entire community. 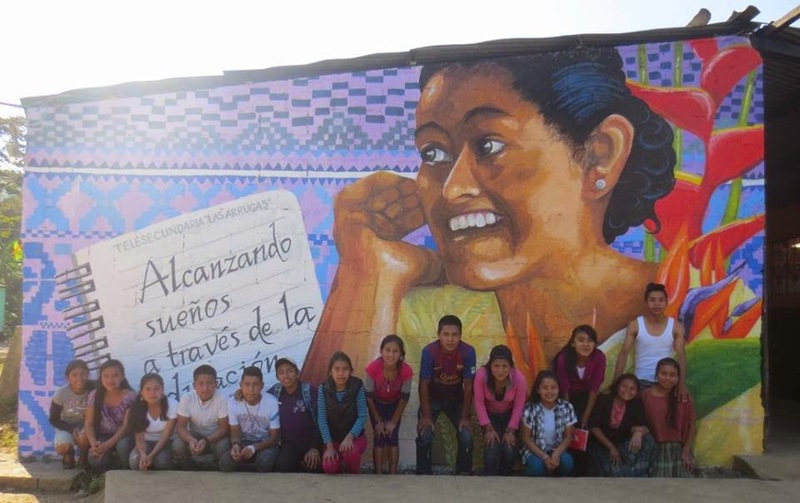 Murals can be educational or informative and even break social, cultural or political barriers. The community is involved in the process, regardless people’s talent, skill or experience. 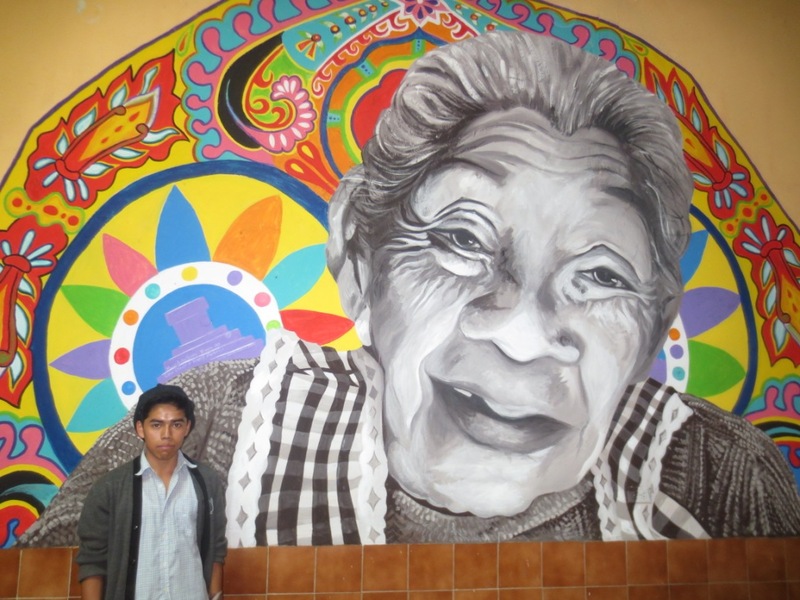 A mural can help define the cultural identity of a community and create community ownership. It can even become a landmark in the community, inspiring and attracting more artists or visitors. The theme is usually chosen in agreement with community members, teachers or students and sometimes with the sponsors. 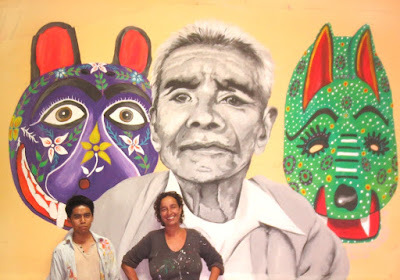 In some cases I organized a series of workshops about the theme and involved the participants in the painting of the mural. 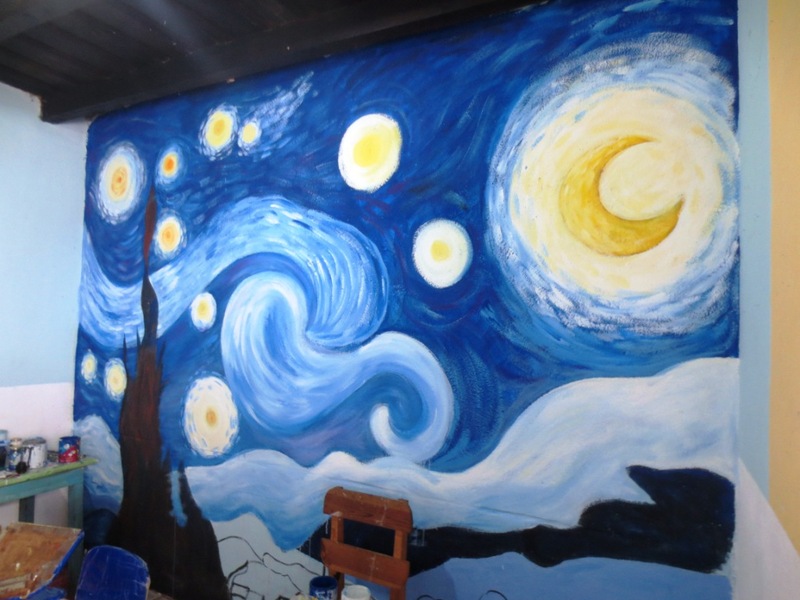 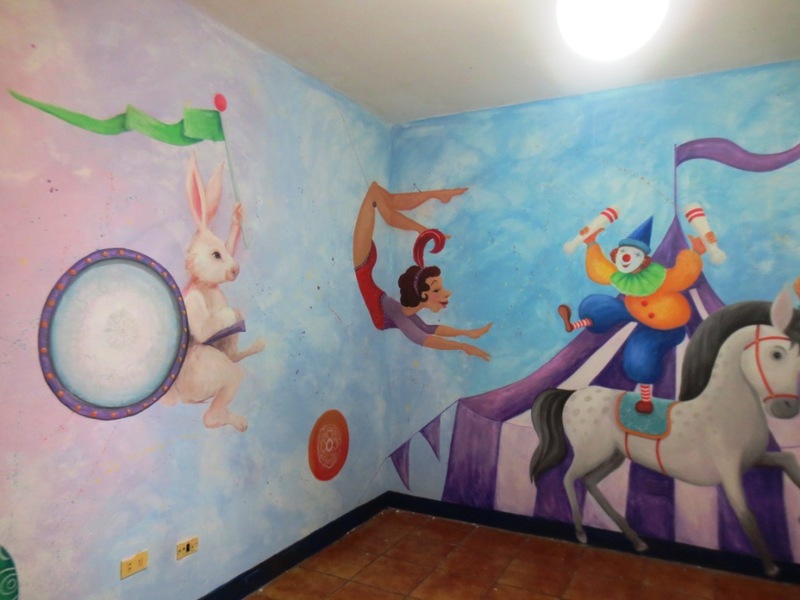 The method depends completely on the wishes of the community and the circumstances, because sometimes painting a mural can be a risky business (inaccessible walls, rickety ladders etc. ), unsuitable for young assistants. 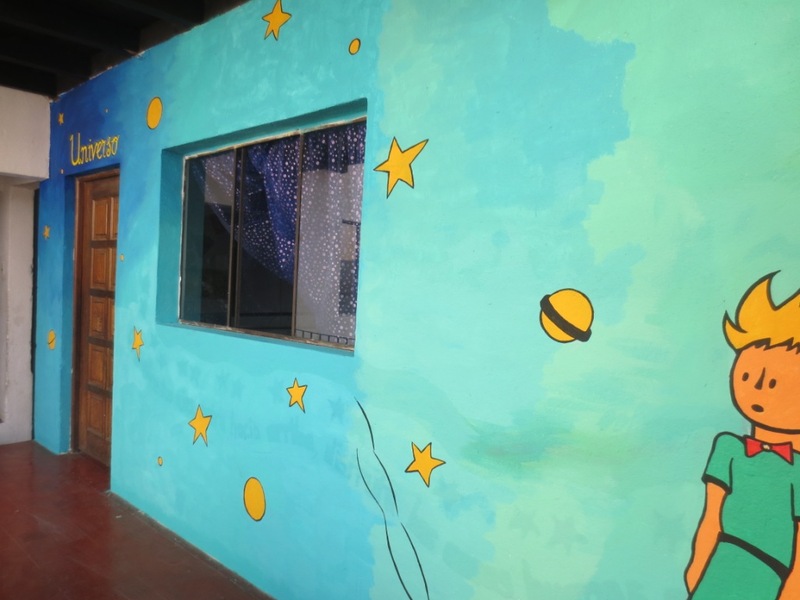 Even if the situation isn’t ideal for direct participation of children in the actual painting, they can be involved by discussing the theme and exploring the way how to visualize the idea they want to express. 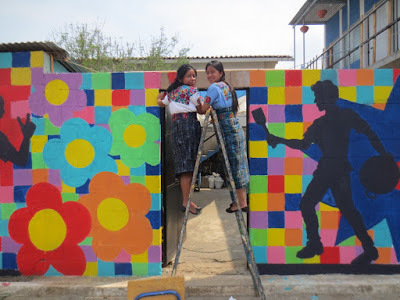 Working as a team is also important, which can be encouraged by painting a mural on big sheets of paper or making a collage together. For more information and pictures, visit MuralArte Guate's website or page on Facebook. 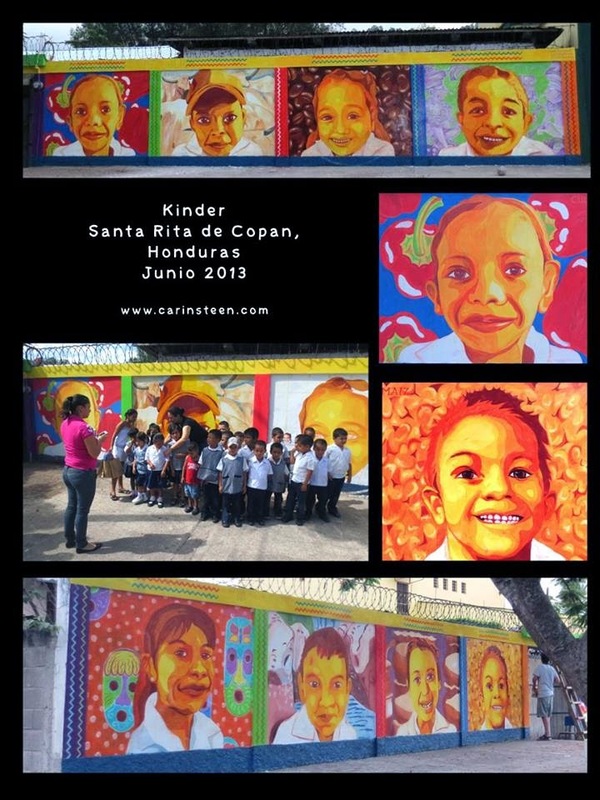 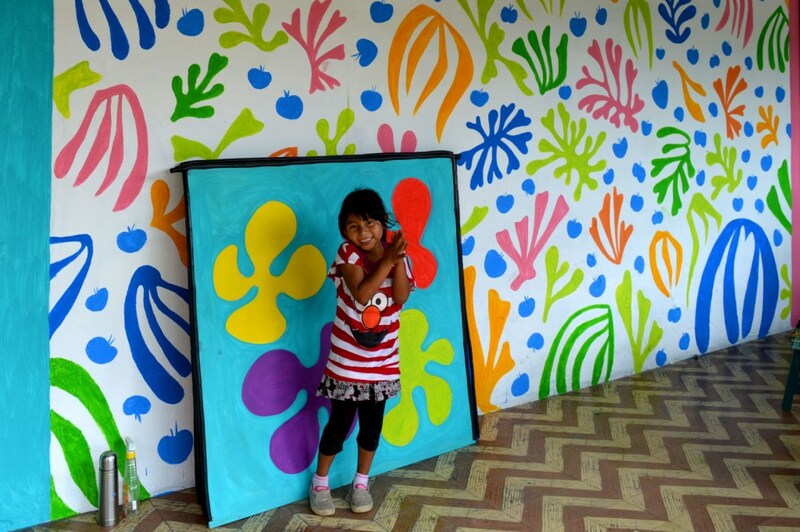 Here a selection of some of the murals I painted in Guatemala, Honduras and other countries. 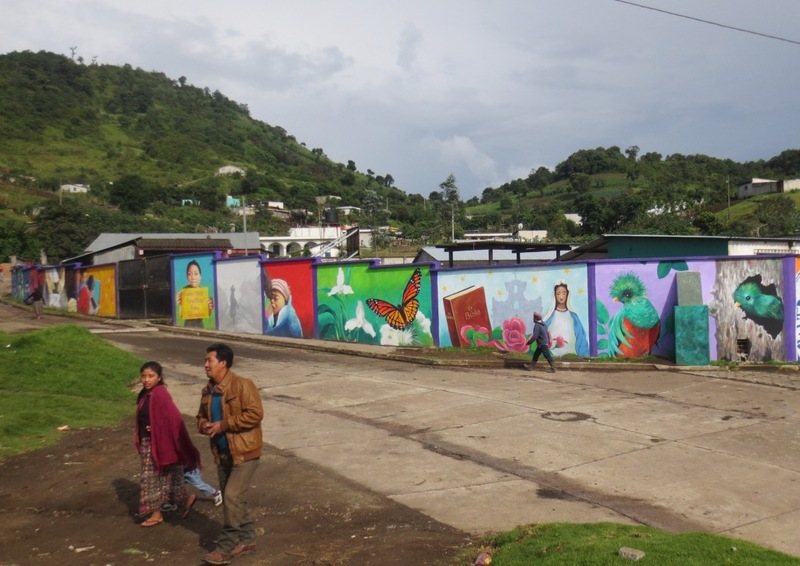 Mural at the Community Centre in Chimachoy, a Maya village high in the mountains, nestled between the volcanoes of Lake Atitlan and Antigua. 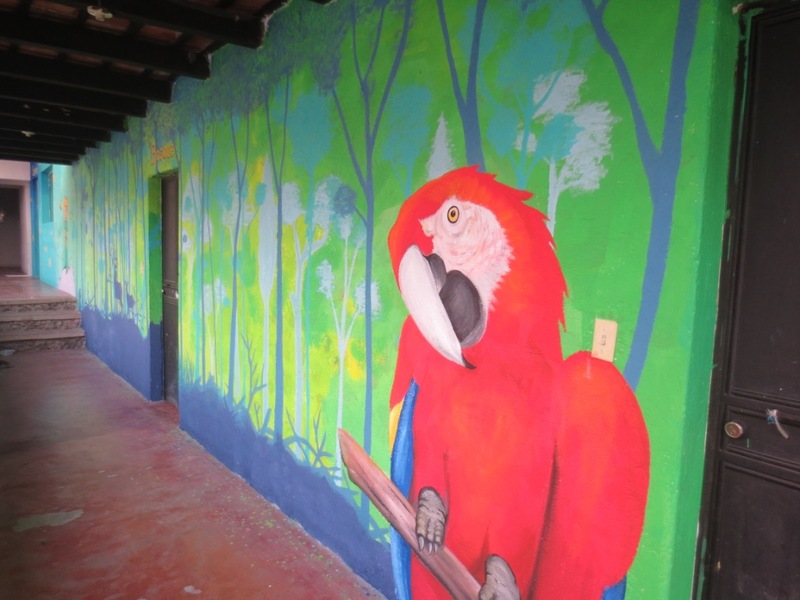 Painted with the help of 7 high school students and thanks to the men of this community who plastered the wall. 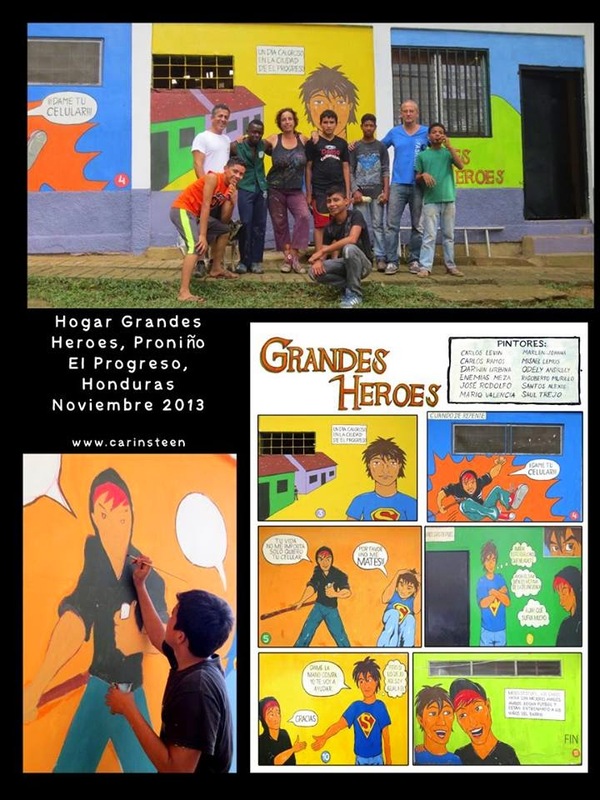 Sponsored by Richard Baars & family, Wendy Russell, Paul Willcocks and Marie-Therese Woltering, May 2015. 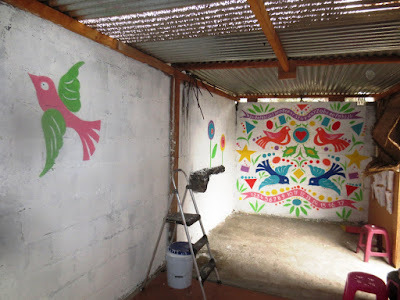 Two of a series of five small murals at the kindergarten Construyendo Sueños in Alotenango, Guatemala. 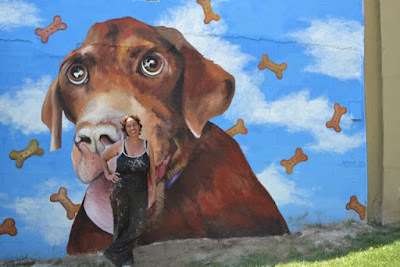 Looking for sponsors for two more murals! 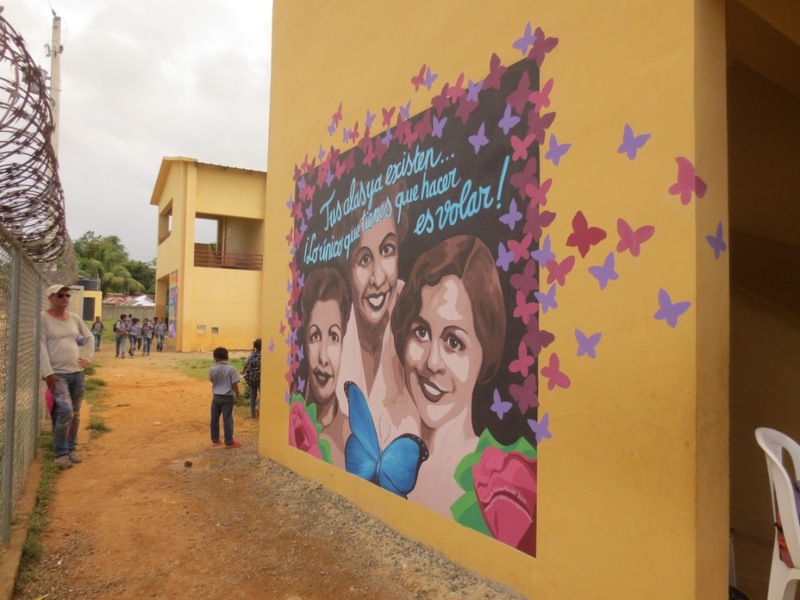 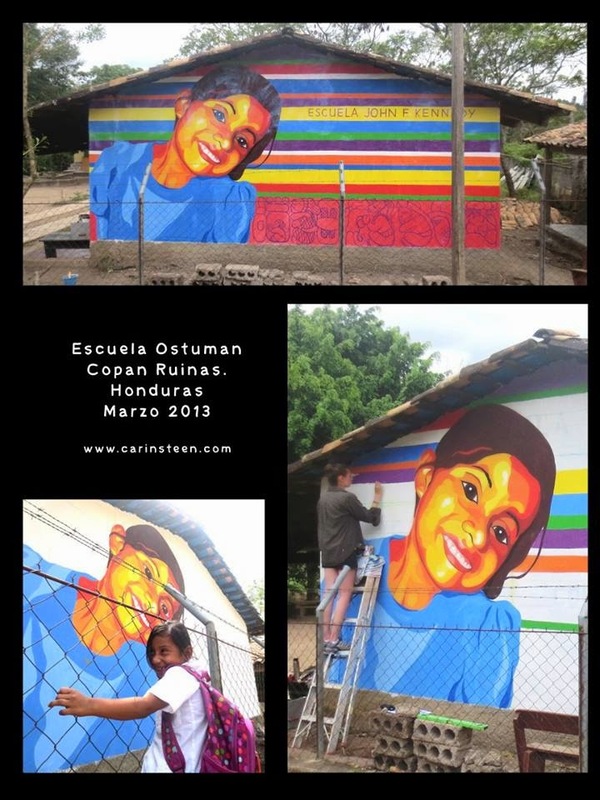 In April of 2015 I went back to the ProNiño children’s home in El Progreso, Honduras, to paint a mural on the newly built dorm, sponsored by the Dutch NGO Colour4Kids. The design focussed on what boys age 7-11 might like while at the same time expressing a positive message. 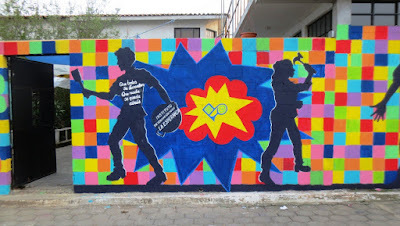 “Everybody is a winner” is the title of this mural, showing young “heroes” rescuing a fog, carrying a basket with groceries and helping out a friend in a wheelchair. 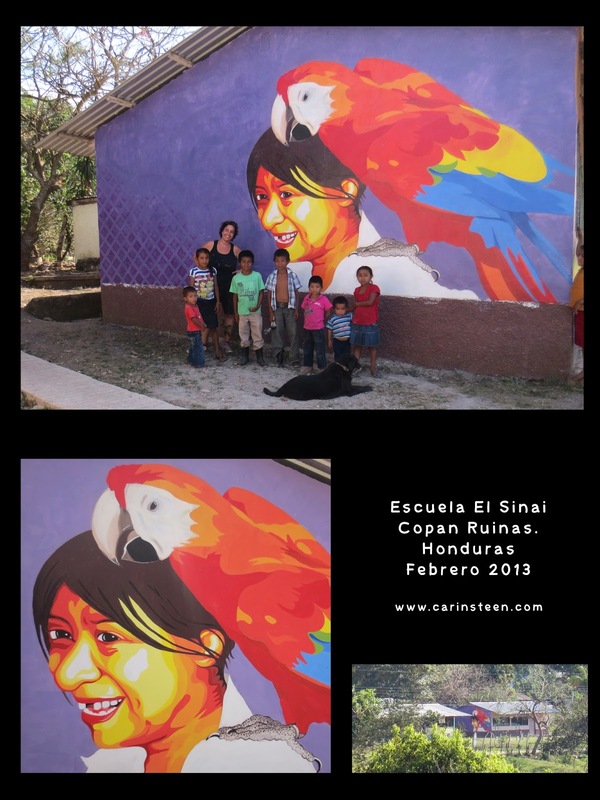 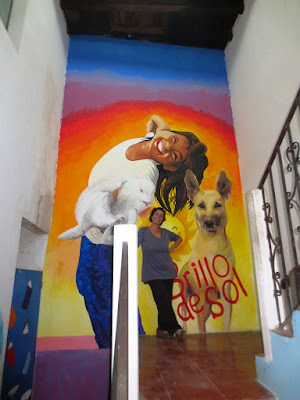 For the CasaSito Association I painted two murals, together with young adults in Cobán Guatemala. 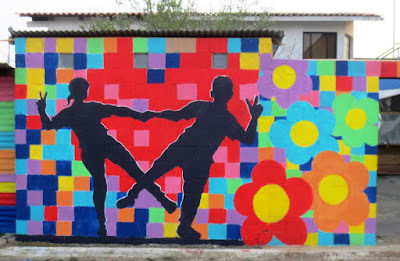 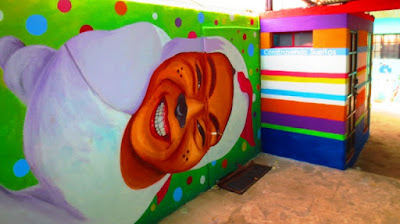 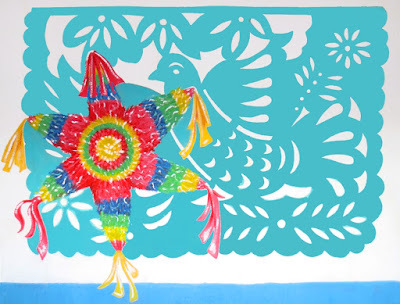 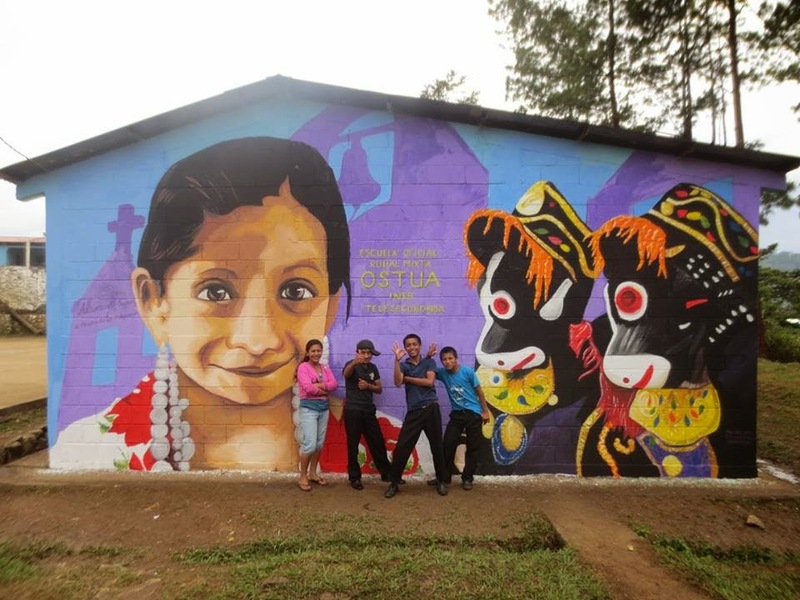 The first one was painted in the outskirts of San Cristobal, a Maya Poqomchi’ community. The theme is the importance of secondary education, especially for girls who unfortunately tend to drop out at an early age. 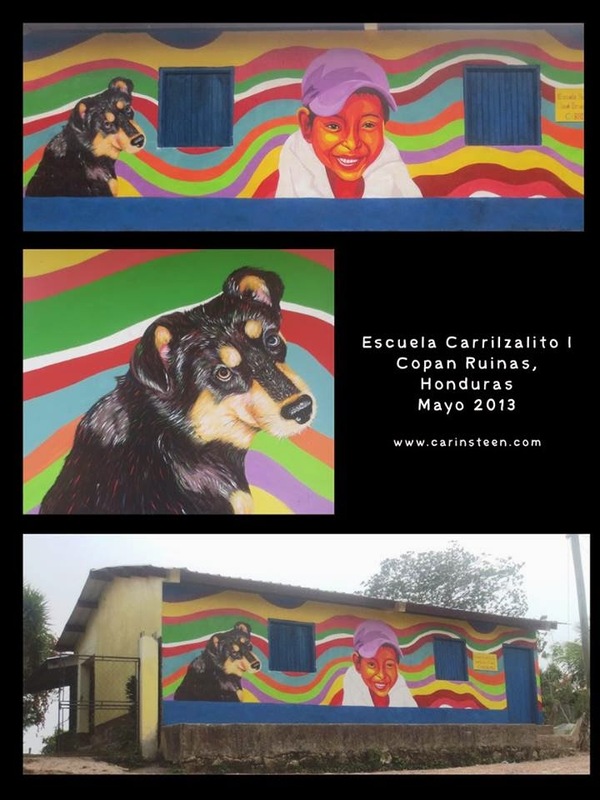 Although I prepared the design beforehand, fifteen CasaSito scholarship students (Age 12-17) were involved in the process from beginning to end and were very proud of the result. In Ostua, a rural Maya Q’eqchi’ community nearby Cobán, the theme of the mural was cultural identity. 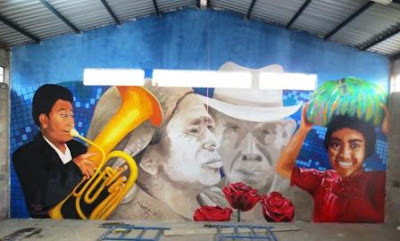 Depicted are a girl in typical dress and two dancers performing the traditional Baile de los Moro. This mural was painted in collaboration with ten young adults from the community. Theme of this mural is the conservation of the scarlet macaw in the Valley of Copán, Honduras. 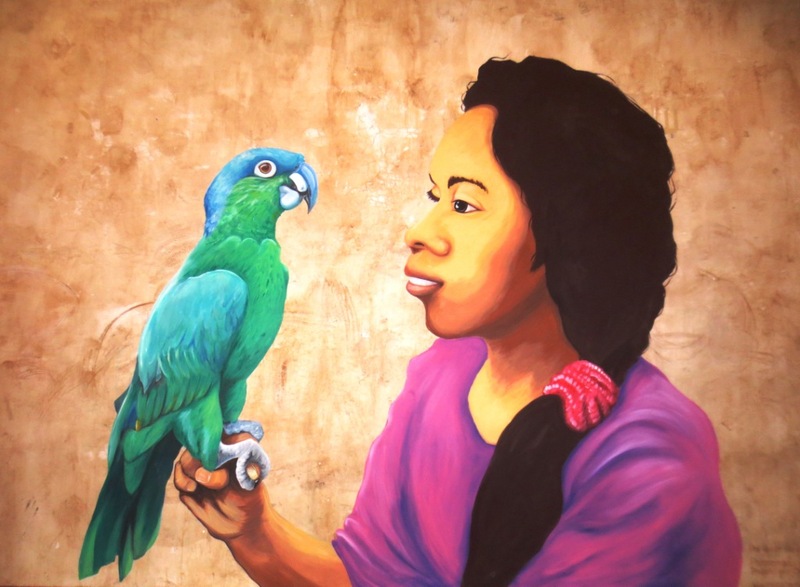 The scarlet macaw is an important symbol in ancient Maya culture and still much valued, as well as the national bird of Honduras. 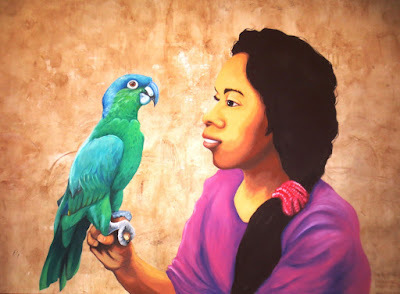 The girl depicted is an actual student of the school, painted after a picture taken when the “Guaras en Libertad” project visited the community, with a real macaw. 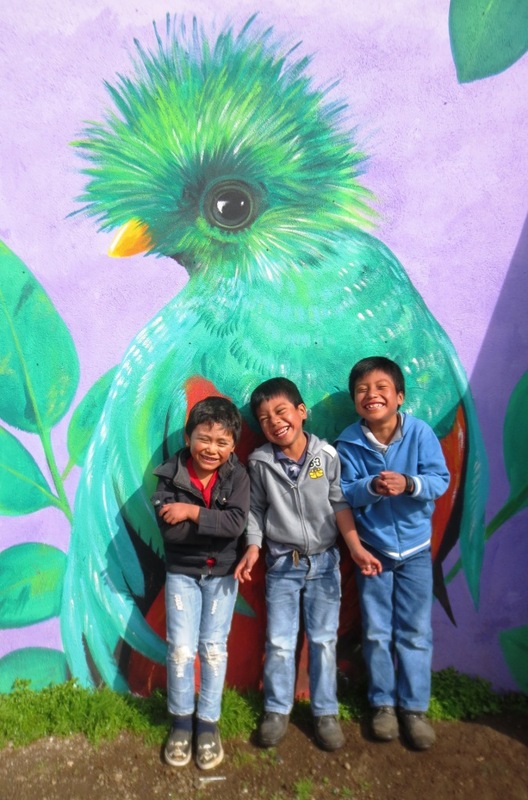 The kids are very proud of the mural and the fact that macaws fly over the valley, sometimes even as far as this small village. 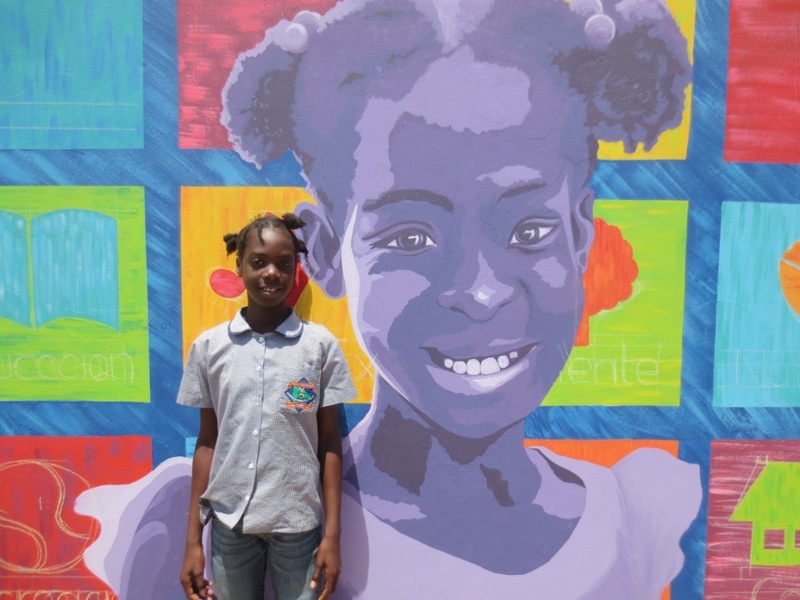 Whenever someone visits the school, the poor girl gets dragged out of the classroom to pose with the visitors in front of the mural. 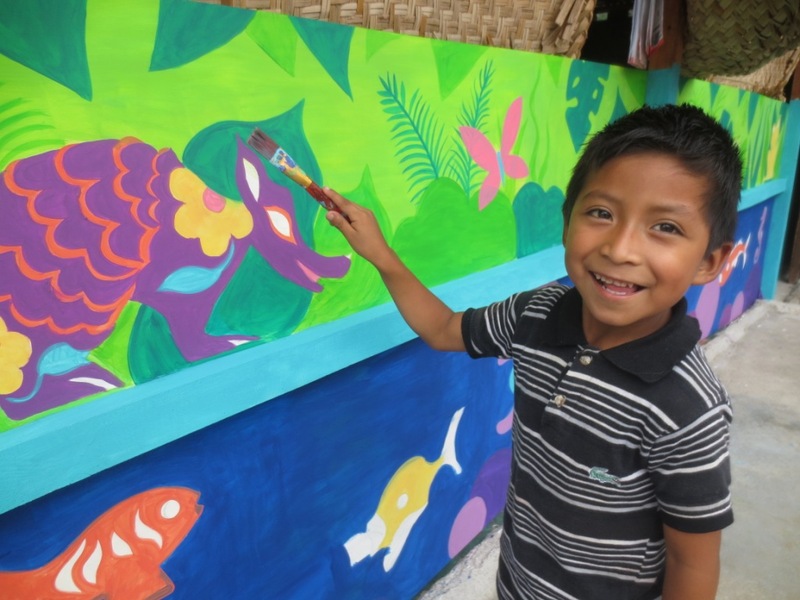 Each year the school in the small Maya Chortí village of San Rafael organizes a terrific cultural event for the whole community. 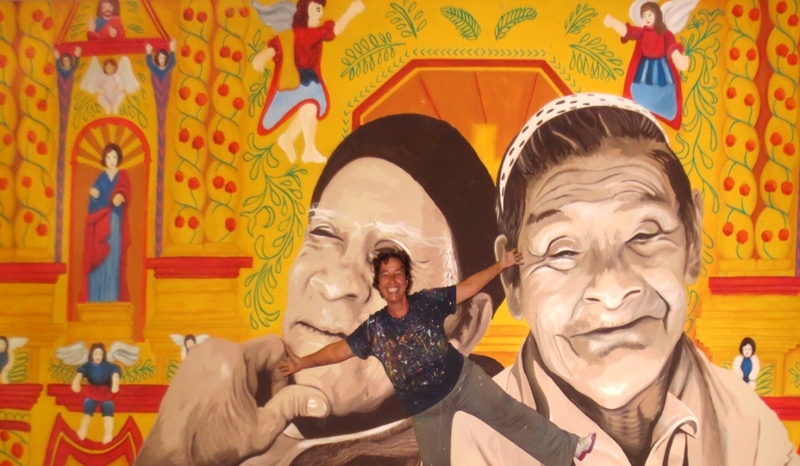 There’s dance, theatre, music and a pageant show in which the “Queen of Corn” is elected. This mural was painted shortly after the event. 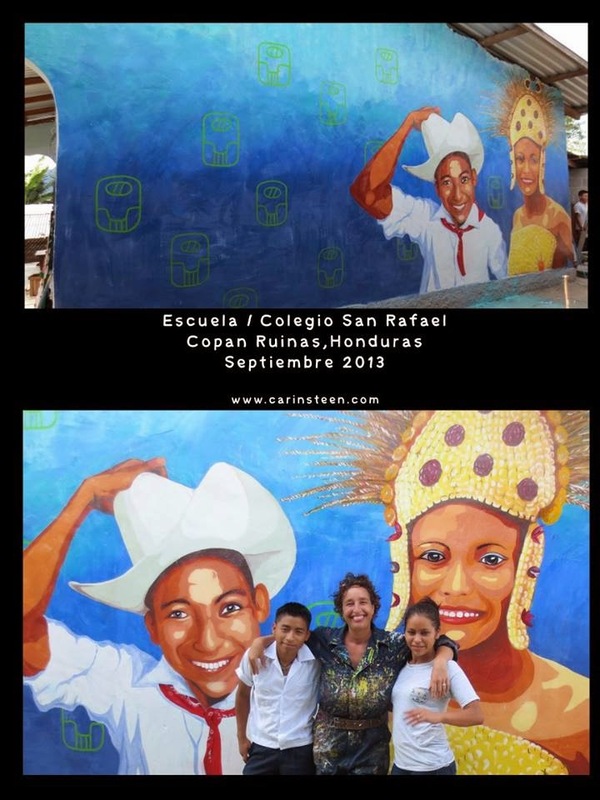 It is called “Children of Corn” and depicts the 2013 Queen of Corn and one of the dancers. On the background Maya glyphs representing corn. 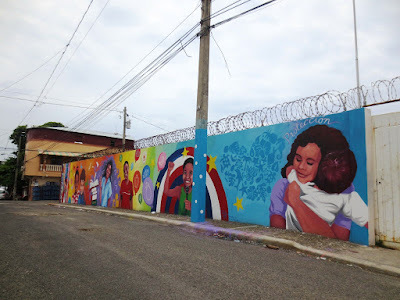 I painted this 12-panel mural together with 12 adolescents of a children’s home in one of the most violent cities of Honduras, The participants chose the theme (violence in the community) and came up with the story lines about a kid who gets robbed of his cell phone. 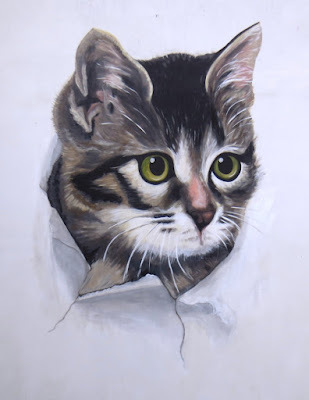 A few days later he finds out his assailant got assaulted himself. 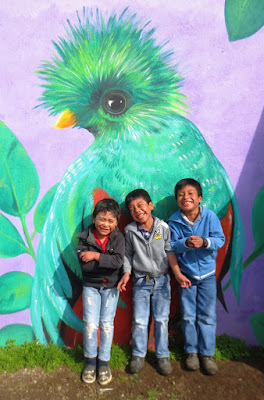 But instead of leaving him alone in his misery, he decides to give the kid a helping hand and they become best friends. 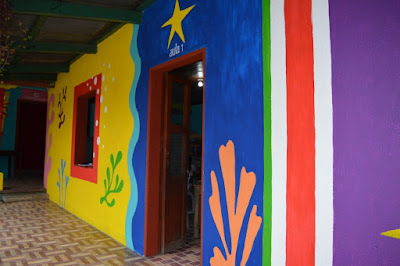 The kids were very proud of their “new” dorm and still keep it in perfect shape. 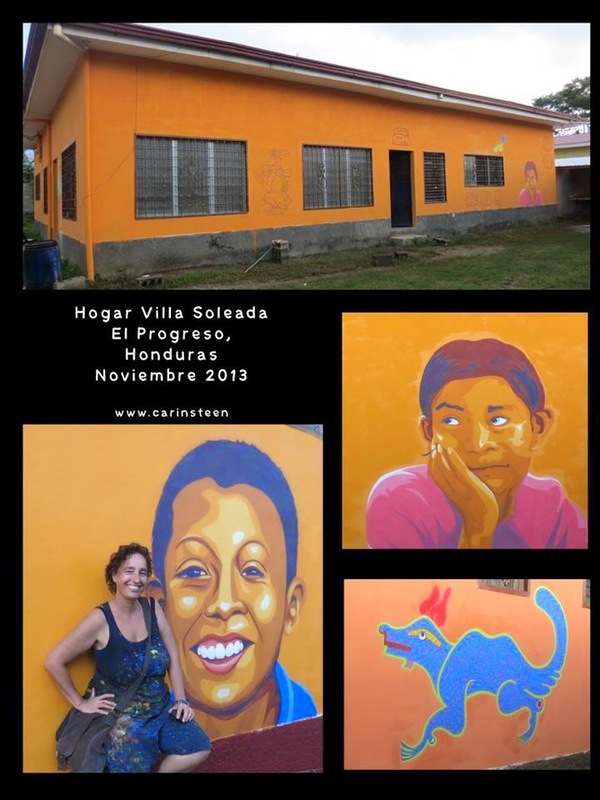 The volunteer home of an orphanage in El Progreso, Honduras, where I mixed (on request) symbols of ancient Maya culture with portraits of contemporary Maya children. 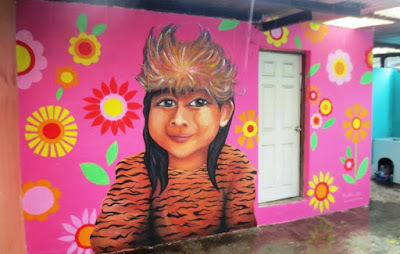 After a series of workshops about cultural identity for the students of grade 5-6, I painted this mural combining elements of ancient Maya culture with a portrait of a Maya Chortí girl from the community of ostuman, Copán Ruinas. 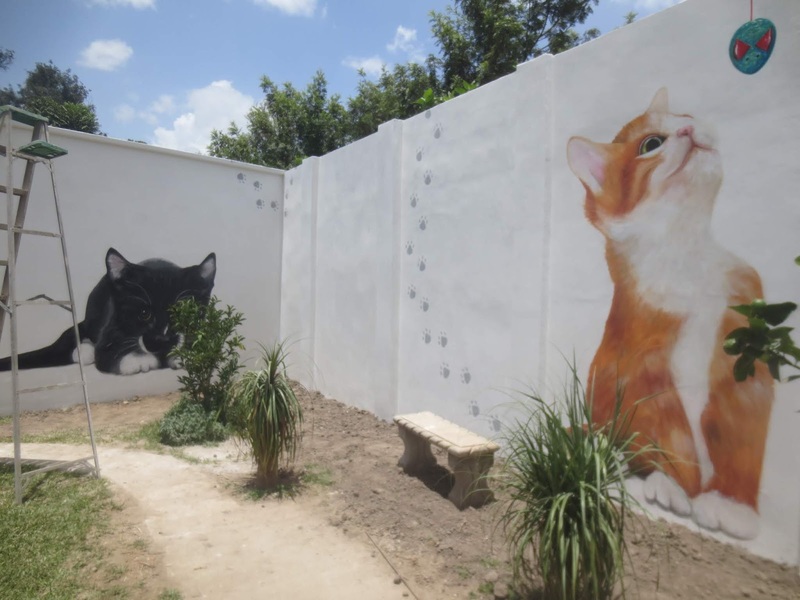 Pets are generally not taken well care of in rural Honduras, so this mural at a school in a Maya Chortí community is all about respect for animals, as well as for each other. The number of girls dropping out of school before finishing sixth grade is alarming in rural Honduras. Hence this dedication to girls who continue there studies in a Maya Chortí village overlooking the famous archaeological site of Copán. 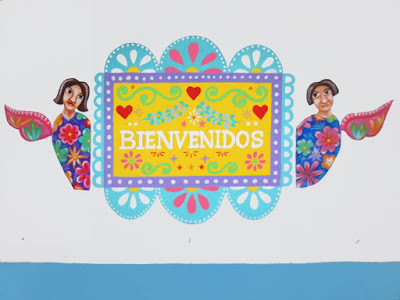 On the background the inscription of Stela J, welcoming visitors to the main plaza. For this 22m long wall at a kindergarten I decided to paint portraits of the students with backgrounds that represent the town: coffee, woodcarving, cattle, Maya culture, agriculture. Ceramics and the local Ruby Waterfall. On request by the community I painted these two Maya women on the wall of a newly built clinic just over the border in Guatemala. 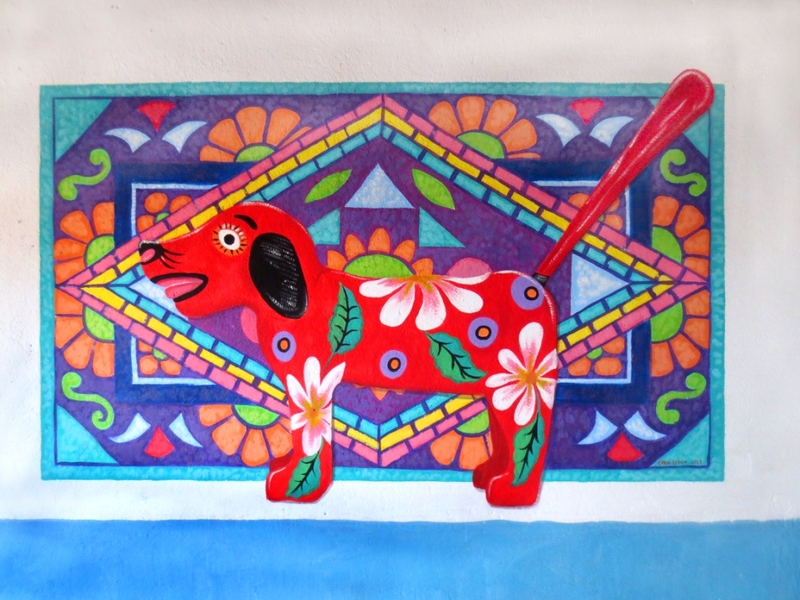 The images are from ancient vessels “translated” into modern colours. 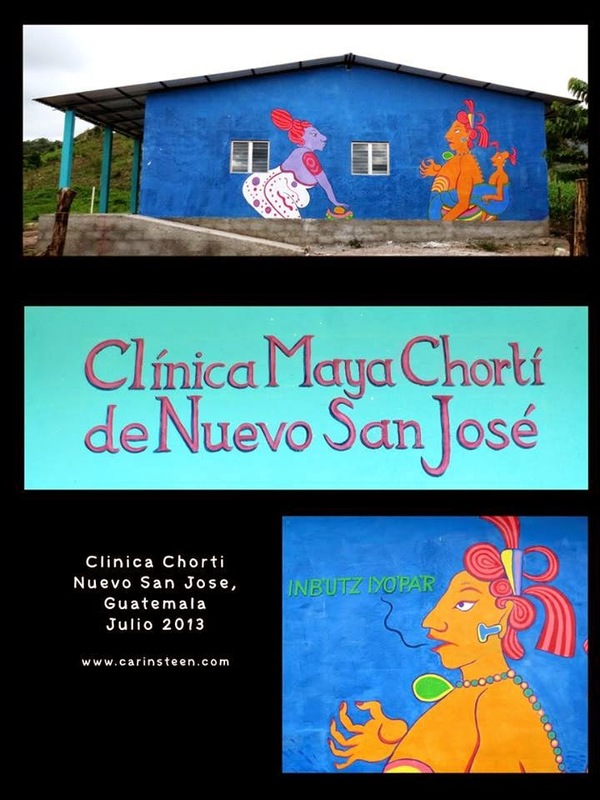 The woman on the right welcomes the patients in Maya Chortí.